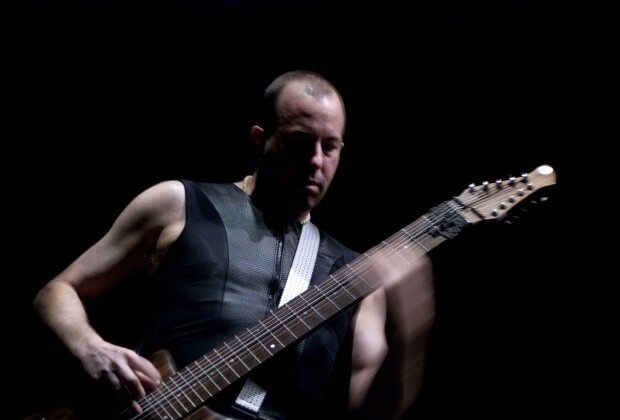 Trey Gunn has toured and/or recorded with artists like King Crimson which he joined in 1994 (he is featured on seventeen Crimson albums), David Sylvian, Brian Eno, TOOL, Led Zeppelin’s John Paul Jones, Maynard J. Keenan’s “Pusicfer,” Vernon Reid, Azam Ali, Michael Brook and Robert Fripp. Gunn’s predominant instrument, the Warr Guitar (which he refers to as The Beast), is the world’s most advanced “touch” guitar. It combines bass and melodic strings on a single broad fretboard to provide the sonic range of a piano. He is the instrument’s most prominent artist and advocate. I’ve seen Trey perform with King Crimson in the past and was always interested in the multi-stringed guitars that he played along with his live set-up. When I saw a post that mentioned he had gone completely digital, I sent him an email asking a few questions about the new rig. I was intrigued to see your recent posting on Facebook saying that you are going “completely digital with your live rig.” Can you describe your set-up before this transition and what about it lead you to look into a digital solution? The two sides of the Warr Guitar (Bass side and Treble side) each go through Carl Martin compressors. The Treble side then goes into the Motu Ultralite and firewires in the the laptop (this setup used a Macbook Pro 1.8 PPC laptop. Then the treble goes into a standalone version of Guitar Rig 4 and spits back out two channels of the Motu. Bass side stays analogue. It goes through a tuner and then into a Lion bass distortion box and out to a direct box. So I end up with three direct boxes that go to the house sound. I grab the guitar lines and send them to a stage amp (usually a Roland or Yamaha keyboard amp) and send the bass line to either an SWR or an Ampeg. All the amps are provided by the venues. The reason to go completely digital was to reduce the amount of stuff that I carry with me even more. And, to add more flexibility to the kind of bass processing I could do. Can you give us details about your new digital rig and does it meet the needs that you set out looking for? The two sides of the Warr Guitar (Bass side and Treble side) go into the MOTU Ultralite (channels 1 and 2). This firewires into my Macbook pro 2.8ghz laptop. This goes into Ableton Live. Because Live lets you build whatever kind of mixer you want, it gets slightly complicated here. But let’s see if I can make it clear. The melody side comes in channel one and goes through a compressor plug-in and then into a Guitar Rig 4 plug-in. This is sent out to the main 1 and 2 outputs. I also have a reverb and delay effect channels that this signal can be routed to, which also goes out the main 1 and 2 outputs. There is an IK Multimedia Brickwall limiter on these outputs. I try not to hit the limiter very much, or at all. The bass side comes into channel 2. It is compressed with IK Multimedia Fairchild 760 comp emulator and IK Pultec eq emulator. Then the signal is split with half of it going directly into a new channel and half of it going through an Amplitude overdrive channel. These get summed together and go thru a further IK compressor and, finally, an IK Brickwall Limiter. Here again, I try not to hit the limiter very much if at all. This channel leaves Live, and the Motu, through a third channel: channel 3. I have an expression controller that can raise and lower the level of the distortion channel. I have switched to using in-ear monitors so there are no amps on stage for me to hook into. The part that is unknown to me at the moment is how to sort out all the foot controllers that I will need. I am currently using the guitar rig controller to control the guitar rig plug-in. But I need a lot more control of all the things I want to do with Ableton live which I can’t with this controller. So I am still working on this. What was the process in choosing Ableton Live? Did you try other options first? I have played around with Logic’s mainstage. It sounds great and boots up faster. 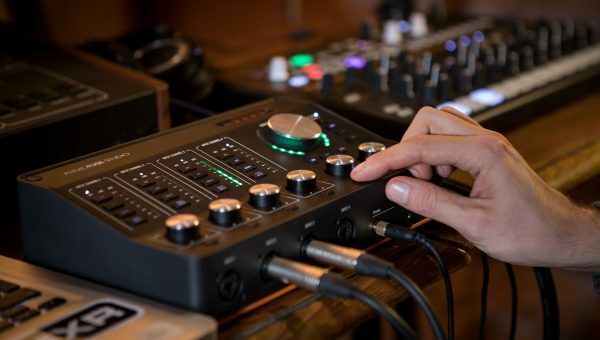 The mixer isn’t as flexible and the interface isn’t as intuitive as Live’s. Plus it seems to use more CPU than Live. Do you see any limitations? The only current limitation to Live that I can see if that it won’t take snapshots of your setup and the parameter settings. Meaning I can’t set all the plug-ins to certain settings (and certain plug on or off) and then just grab a snapshot of the whole thing. Then I could have 10 snapshots and just have a foot switch that would change from one to the next. This isn’t currently possible without a fair bit of work around. Live isn’t currently setup that well for guitarists in that it is lacking this feature. But…. The other possibilities of routing and real time control outweigh this drawback and I am going with Live anyway. 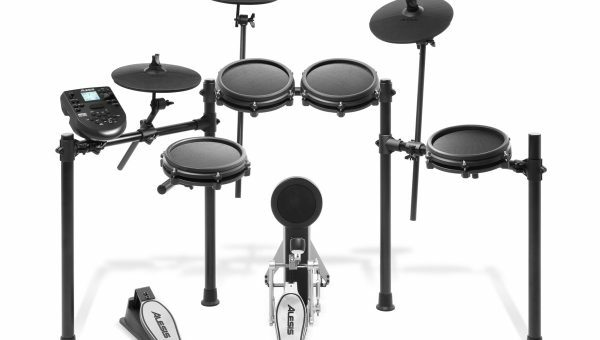 I know you describe it as your “live rig” but do you plan to use it in the studio as well? What projects are you working on now and did they have any influence on this new approach? This is the setup for my band KTU (www.myspace.com/ktuband) with Pat Mastelotto and accordionist Kimmo Pohjonen. However, I am look towards doing some solo performances and am searching for new ways to use looping. This seems to be the best setup to delve into that. 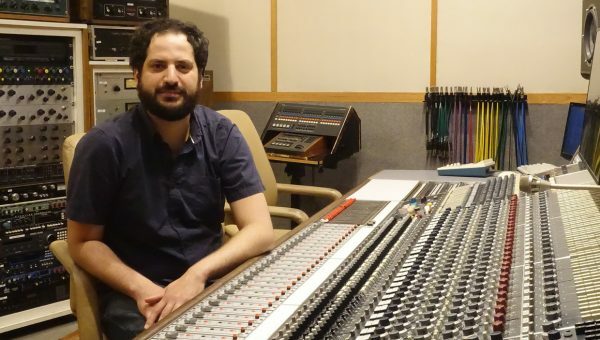 Are there any tips or advice that you can give other musicians who are looking to make the switch to digital? Yes. Get the fastest laptop you can afford. And the fastest firewire interface you can afford. I am running at about 6-7 ms delay. Which for some people is irritating. For me it isn’t so bad – it just feels like a slight chorus on the bass notes at times. But considering that 7ms is the equivalent of having your amp 7 feet away from your ears…. Well…. I can handle it!! !